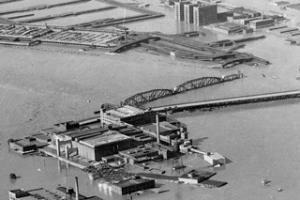 The beginning of the end came for the Kansas City Stockyards in July 1951 when the West Bottoms suffered the worst flood in the city’s history, one from which the industrial district never fully recovered. 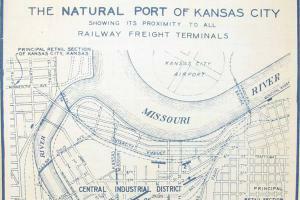 Kansas City claimed a population of just 4,418 in the 1860 census. 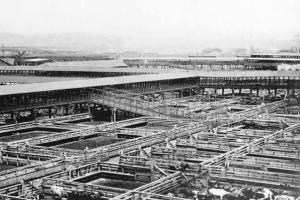 With the opening of the Hannibal Bridge in 1869, and the arrival of the cattle trade and development of the stockyards, the city exploded onto the world stage, boasting the second largest livestock market in the United States and a population of over 160,000 by 1900. But how did this come to be? “Paris of the Plains,” the “City of Fountains,” and more recently the “Soccer Capital of America” are all names that come to mind when one thinks of Greater Kansas City. Or at least that’s how boosters have tried to promote the city in an effort to shed its stereotypical Midwestern “cowtown” reputation. 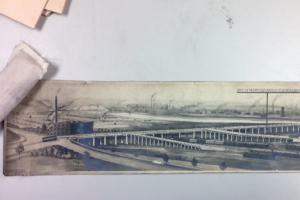 Kansas City has transformed itself geographically, demographically, economically, and culturally since the days when the Stockyards occupied the West Bottoms, but to forget the city’s livestock industry roots does a disservice to its unique and rich history. Carrie Westlake Whitney and Carl Busch: "A Christmas Greeting to Kansas City Children"
Do you remember way back when / (Say, thirty, forty years) You never saw your sweetheart’s limbs / But judged her by her ears? Not a soul had appendicitis, / Nor thought of buying glands, / The butcher gave his liver away, / But charged you for his hands. I’ll spare you the other five. 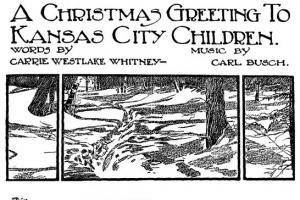 Read more about Carrie Westlake Whitney and Carl Busch: "A Christmas Greeting to Kansas City Children"
What’s the saying? One man’s trash is another’s treasure? Lucinda Adams recalls the day, five years ago, when she and a couple of members of the Library’s facilities staff were led into a converted storage room in the old Kansas City Livestock Exchange building in the city’s West Bottoms. The place hadn’t been touched for decades and it looked it — dusty and unkempt, hundreds of drawings and other documents in piles or strewn across the floor. 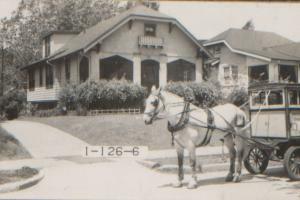 Pleasant Lea seems to have become just as important to his new community in Missouri as he was when he lived in Tennessee. In January 1852 he was appointed as a US Postmaster. The Confederate general had nothing to do with it. Someone who’d been working on the railroad didn’t know how to spell. Lee’s Summit, Missouri, has an elementary school, a middle school, and a 16-1/2 acre park, all within a few blocks of each other, all bearing the name Pleasant Lea. A lea is a grassland or a meadow. 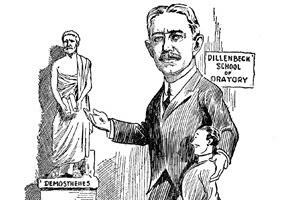 It would be reasonable to think that the two schools and the park got their names because they were situated by a grassy meadow that was enjoyable in quiet way—a meadow that was called Pleasant Lea. Perhaps you've spotted Google's Street View car cruising through Kansas City, making a photographic record of whatever it happens to pass by. It's easy to spot. In addition to the Google decal on the side of the vehicle, you can't miss the big 360-degree camera mounted on top of the roof. Nothing escapes this camera — every home, building, vehicle, and passerby makes it into the image that serves as Google's record of that particular street — at least, until the next time they drive by several years later. In the 1900 census, I found that John F. Stac[e]y taught in the Chicago school district, and that his wife, Anna, was an artist. By the time this particular blog gets posted, the Missouri Valley Room’s exhibit of charcoal drawings of Confederate guerillas who operated here in the border area of Missouri and Kansas during the Civil War—bushwhackers like Frank and Jesse James, Joe Lea, Cole Younger, “Bloody Bill” Anderson, and William Quantrill—will probably have been up for a week or two.